My results section is through its second draft. I still need to give it a good workout to get it into halfway decent shape, but at least it’s now 30 pages long rather than five. I had a cheery walk yesterday with third-and-final son, Sparky, Willis and my youngest brother’s Jack Russell terrier, Pippa. Pippa has the shortest legs I have ever seen on a dog. They’re so short – especially compared to the length of her body – that she can’t even sit down in a properly dog-like manner. So watching her trying to keep up with Sparky and Willis sprinting through the long grass was hilarious. She kept losing them, at which point she’d stop and jump high in the air until she spotted them, then race to that location… only to find they’d moved on already, at which point she did the high jump again. 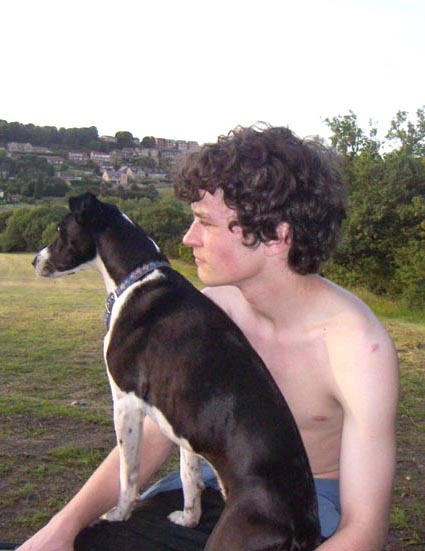 Consequently Pip got quite tired, so son and I gave her an occasional lift, which was very pleasant as she is a very cuddly dog. No, I didn’t have my camera. Is anyone surprised? I’ll take it next time. 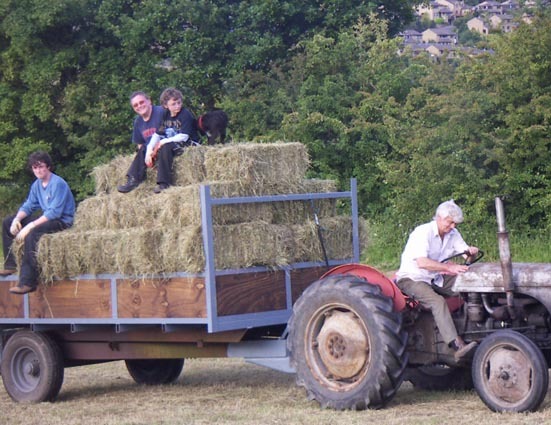 Here are the rest of our haymaking pics, posted in tribute to my father’s several hours of labour on his own to get some hay off the top field. 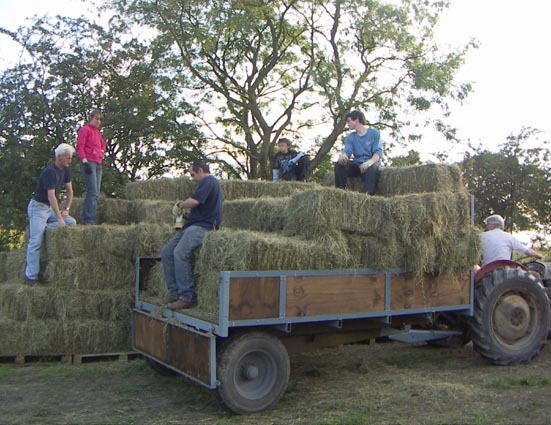 We got 211 bales from the hayfield in two hours. My dad working on his own got – wait for it – 17. But the grass was much thinner, plus the baler broke down and he spent quite a bit of time sorting that out. Here you go Dad. Always remember, the more the merrier. 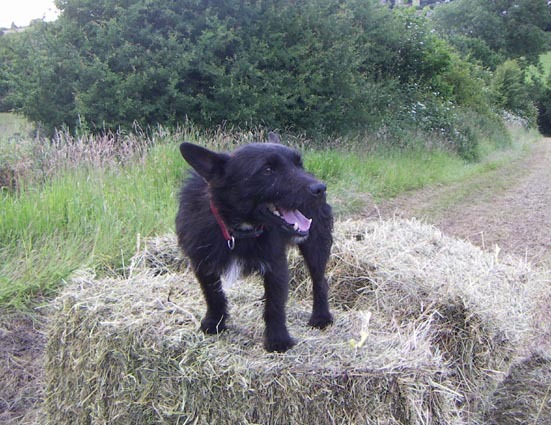 Sparky has been brought up as a town dog, and she struggled with the idea of haymaking. 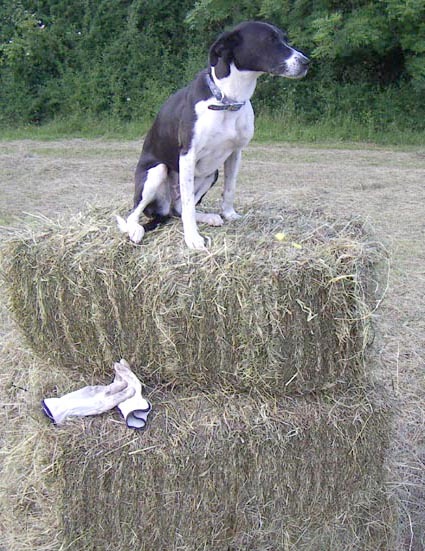 She wandered around the field, had a few sniffs in the verges, but basically kept looking at me with a confused expression as if to say “why are we staying in one place?” I lifted her onto the bales for her portrait, and she looked positively traumatised. And then there’s Walter, who is a country dog through and through, and had a whale of a time right up until third-and-final son got Willis out of m’sister’s car. Willis and Walter are sworn enemies, and eventually had to be unlatched from one another’s throats – by means I’d rather not go into in polite society – and were banished to 4WD and pickup, respectively. 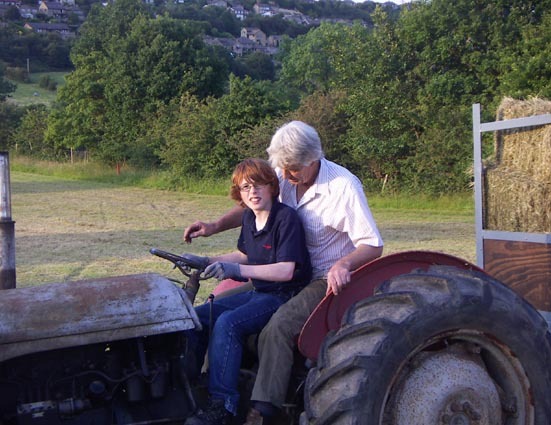 Son-in-the-middle gets a tractor driving lesson from Grandad. The hay in its over-winter stack. The one in the pink top is m’sister. I was just about to give her a hard time for not turning up until the last half hour, when she got in first and pointed out that she and her partner had done it all last year as I was unavailable. Sorry sis. A hard but satisfying couple of hours work. Now it’s homeward bound.